Which Celebrities choose Reformer Pilates? Pilates (pronounced pi-LAH-teez) is a form of exercise developed by Joseph Pilates in the early nineteen hundreds. This exercise system was originally adopted by dancers and gymnasts as a way of keeping supple and strong, but as the increasing benefits of the system became known to more people, it evolved into a popular means of keeping the body lean and healthy. Celebrities such as Jennifer Aniston, Oprah, Tiger Woods and Charlize Theron have adopted the Pilates exercise system. 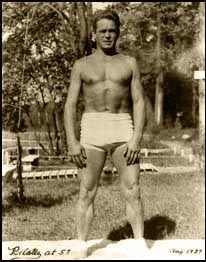 Joseph Pilates was born in Germany in 1880 and in his childhood he suffered from a number of diseases and health problems. Pilates was a weak child but had a strong will to become fit and strong. At a young age he began to study anatomy and various forms of exercise to improve his health and physique. As the years went by, he took to sports and body building as well as a career in boxing. During World War I, as a German traveling abroad, he was interned in a camp for enemy aliens on the Isle Of Man. Joseph became a nurse and it was during his stay there that he used his knowledge of exercise to help rehabilitate bedridden patients, using bedsprings as equipment. He designed exercise apparatus for immobilized patients by attaching the bedsprings to hospital beds. This system formed the foundation for his style of body conditioning and specialized exercise apparatus, including the initial Reformer. His practices kept his disciples healthy during the outbreak of influenza and were so successful, that when the 1918 flu epidemic swept the world, not one of his followers died, even though thousands of others in the UK perished. After moving to <?xml:namespace prefix = st1 ns = "urn:schemas-microsoft-com:office:smarttags" />New York City, he opened a gym close to a number of Ballet and Dance Schools. These studios helped popularize his unique concept of exercise that involved both the mind and the body to keep the body flexible, strong and healthy. The Pilates system of exercise quickly gained popularity in the U.S. and its followers also modified and adapted the original 34 exercises to make them more acceptable to the general public. Today, the most common form of Pilates practiced is Matt Pilates, due to the ease of practice in gyms and classes. Other variations of Pilates, including the use of the Reformer, continue to grow in use and popularity.